The most accurate description I could come out with this anime: It's a 'moe-horror' anime. At first glance, and perhaps first few episodes, the story looks really light hearted considering what the setting is. But as you go on, stuff gets really grim later on. It's not your average high school adventure featuring cute girls doing cute thing. It's more than that. 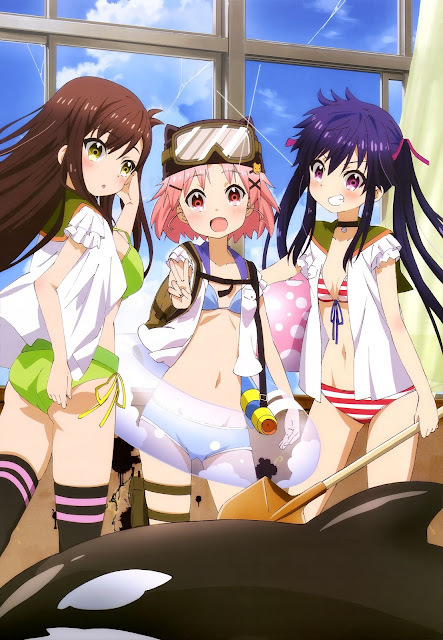 The plot features a light-hearted exposition to introduce the characters in a cute and fun way. 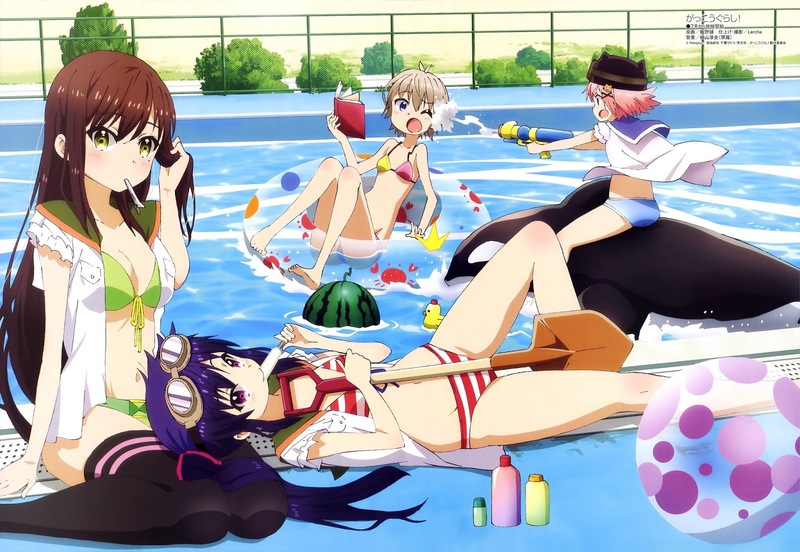 They does what you expect a normal high school student would do: studying, having field trip, going to pool, etc. But there's a catch. 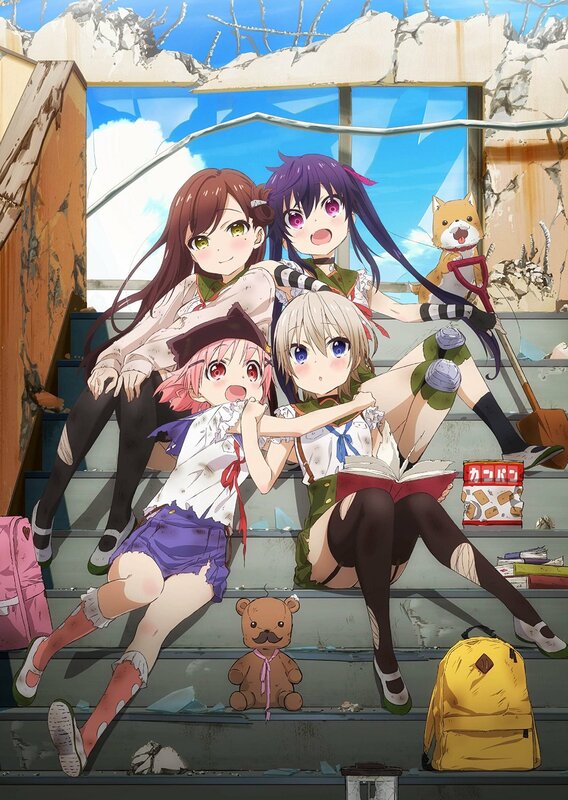 It's all a way to cope with the unsettling post-apocalyptic zombie infested world pretending it actually never happened, which actually makes the anime itself a psychological roller coaster ride. There’s a sense of self-awareness maintained in the writing throughout, whether it’s literally pointing to other works that it has drawn inspiration from such as the movie ‘I am Legend’ and the novels of Stephen King. It doesn't actually shy itself from giving hints here and there about important plot device, which unfortunately makes the story rather predictable. It does however raise a lot of questions, regarding how these girl actually did survive for god how long in the conveniently built school, which thankfully explained a little bit at the end. Speaking of the ending, it goes with an anime original ending; maybe a little bit unsettling for the manga readers but the bitter-sweet alternative end actually gives hope as to what will happen to the girl afterward. 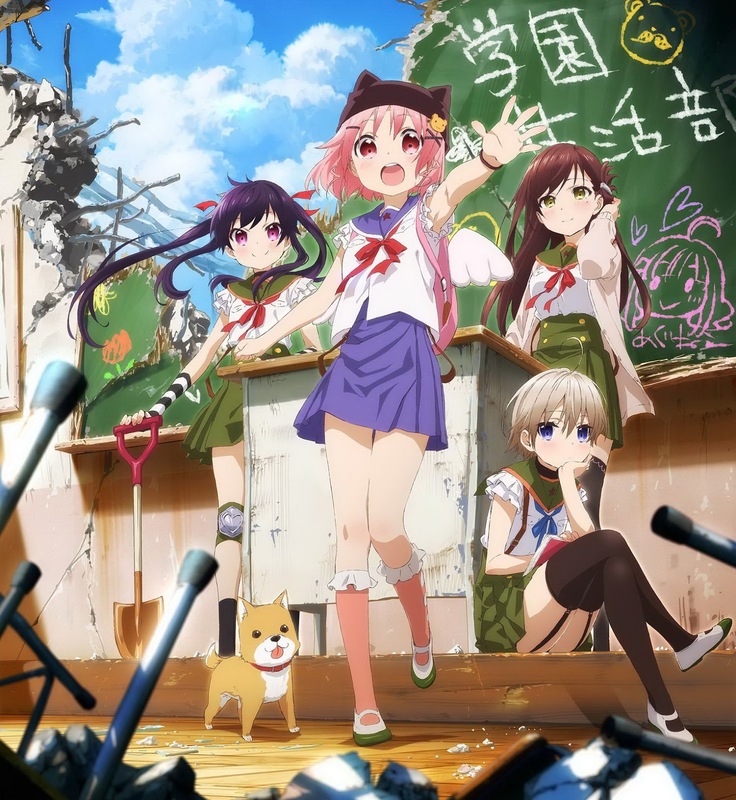 There aren't that many characters in the anime itself so to speak; four members of the school living club, their supervisor teacher, and a pet dog. Oh, and a bunch of zombies. 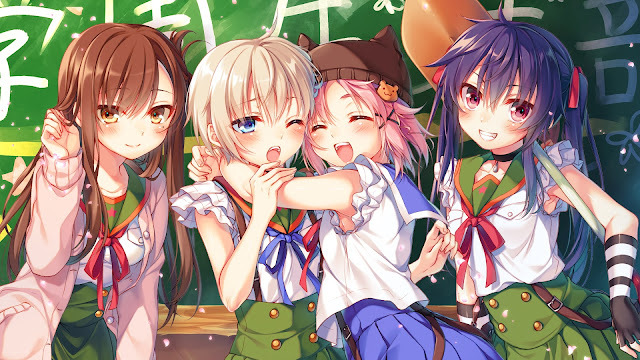 At first glance, each of them looks like a generic slice of life anime characters; the cheerful Yuki, the matured Yuuri, the energetic Kurumi, the cool yet stoic girl Miki and the clumsy but adorable Megu-nee. But as the story progress further, you could see that each of them had to dealt with some kind of inner mental conflict from being disillusioned, traumatic event from the past and the feeling of regret haunting them. It's more than what it meets the eyes. At one point, it is refreshing to see cutely animated girls facing unspeakable horrors. Your perspective really change after seeing the change in their facial expression, and how they actually react afterward. Since there are not that many cast, there are plenty of room for interactions between each character, albeit the character development only picked up later on. The art and animation for this anime is really wonderful so to speak. It manages to balance out between a happy, vibrant tone and a much grim darker setting the story takes place in. The usage of beautiful colour pallete earlier in the story give you a really warm start, tricking your mind into believing that perhaps maybe it's fun to live in a school in a world like that. It all gets much darker slowly yet steadily with each episode. The animation is fluid with no issue at all. 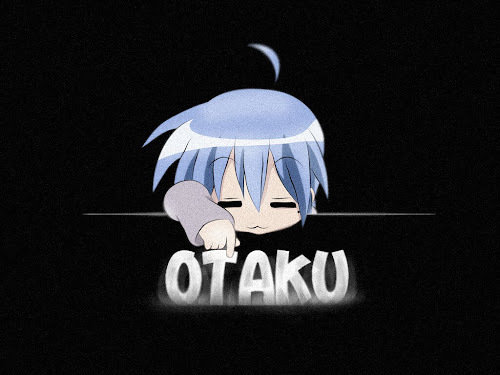 As for the music, I really enjoy how ironic the OP music is. The OP features a really happy and cheerful music, with equally happy animation sequences. But the OP song itself subtly changes to remind you the harsh reality that the girls actually faced (trust me, you don't want to skip the OP and note carefully at the subtle changes for each episode). 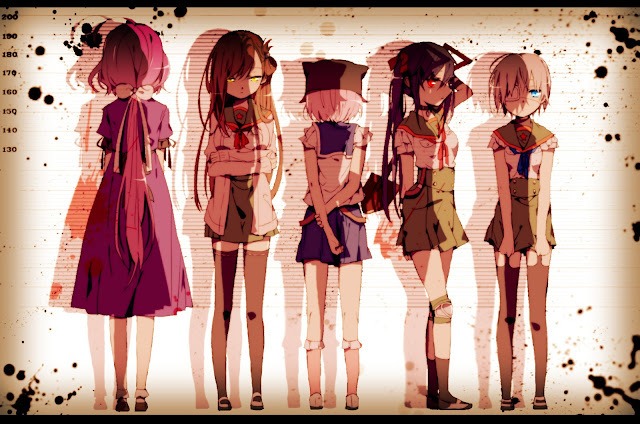 The ED music are much slower, and melancholic at time. The first ED was really calming, representing a happier time for the girls and the second ED are much more melancholic fitting in well with how the story goes. The OST used are not bad, and mostly fits with the overall setting. 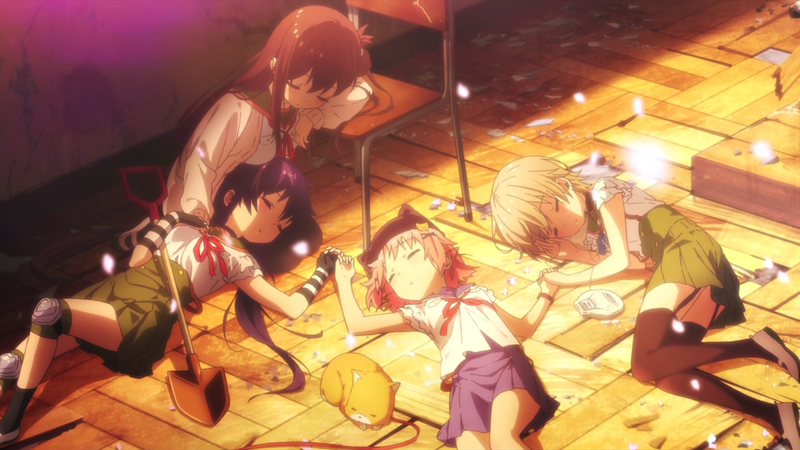 Overall, I really enjoyed this anime so much. The ride is really wild, from a happy fun start, to a gloomier tone halfway and finally a full-fledged crisis at the end. It really blows your expectation, from the first episode itself. It manages to deliver, and gives the viewer something really refreshing once in a while. 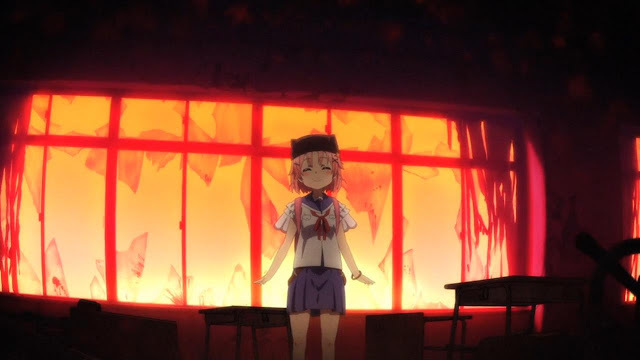 Gakkou Gurashi really define what 'moe-horror' anime is.